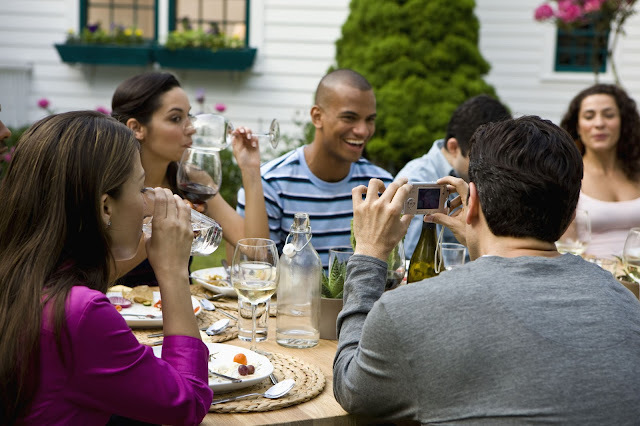 When you smile at a party, your facial expression is emotionally consistent with the happy context and as a consequence other guests will in future be more likely to remember that they've seen your face before, and where you were when they saw you. That's according to a team of Italian researchers led by Stefania Righi who have explored how memory for a face is affected by the emotion shown on that face and the congruence between that emotional expression and its surrounding context. The researchers first presented 30 participants (11 men) with 64 unfamiliar face and scene pairings. The faces were either smiling or fearful and they were either presented alongside an image of a happy scene (e.g. a party) or a fear-inducing scene (e.g. a car crash). The participants' task at this stage was simply to indicate whether each face-scene pairing was emotionally congruent or not. Next came the memory test. Different faces (some previously seen, some new) were flashed up on-screen against a black background and the participants had to say whether they'd seen the face before or if it was entirely new. After each face, three scenes appeared of the same genre (e.g. three party scenes), and the participants had to say which specific scene the face had previously appeared alongside. Previously seen happy faces were better remembered than fearful faces, but only when they appeared alongside a happy scene. Memory for fearful faces, by contrast, was unaffected by the congruence of the accompanying scene. Why should smiling faces at a party or other happy context be better remembered than a fearful face? The researchers think the combination of a smiling face and happy scene has a broadening effect on observers' attention, enhancing their memories for the face. From a methodological point of view, it's a shame the study didn't also feature neutral faces: without these, we can't be certain whether smiling faces in a happy context were enhancing memory or if fearful faces in that context were harming memory, or a bit of both. Figure 3 from Righi et al, 2015. The researchers also propose that smiling faces have a "unitising effect" whereby the face and its context are bound together in memory. 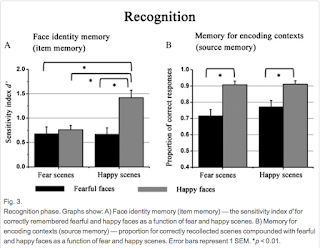 This idea also appeared to be supported by the results: participants were better at remembering the accompanying scenes (happy and fearful) for smiling faces than fearful faces. Put these two key results together and it means that we're particularly likely to remember a smiling face we saw at a party, and the specific context we saw it in. Righi and her colleagues said it made sense for memory to work this way. "A smiling person communicates a social bond and the ability to remember, not only the face identity, but also the context of the first encounter with that 'potential friend', could reflect an adaptive behaviour in view of future social relations." The new results also complement past research on memory for face-name pairings: presented with a name, participants were better at remembering when it was earlier paired with a happy face than a neutral one.